Thanks for stopping by to my first art blog post. This is my new artwork. Let me introduce you to "Fang". Don't let looks deceive you, he is more vicious than he looks! 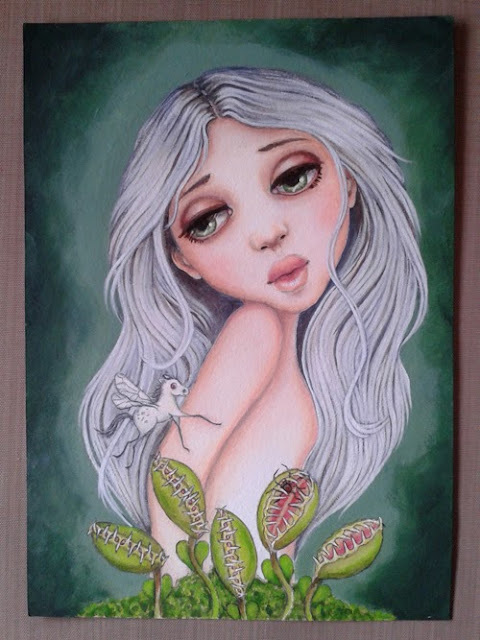 My son's Venus Flytrap plant was the inspiration for this painting. 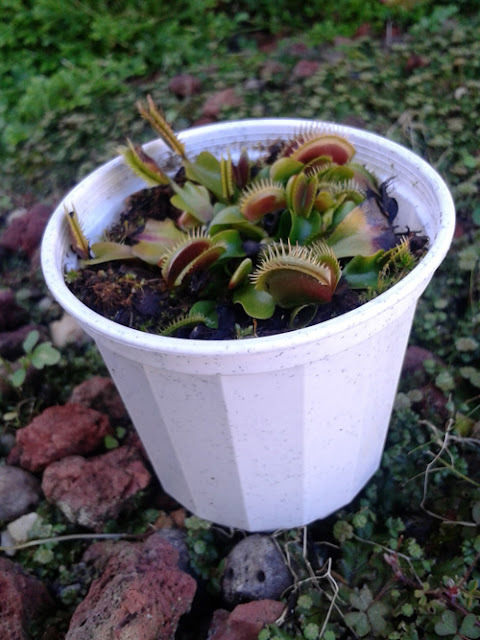 It made me think how nature uses different ways to lure its prey. As in nature, we are also enticed and tempted by lots of different things that surround us from day to day. Initial sketch on hot pressed 140 lb watercolour paper. 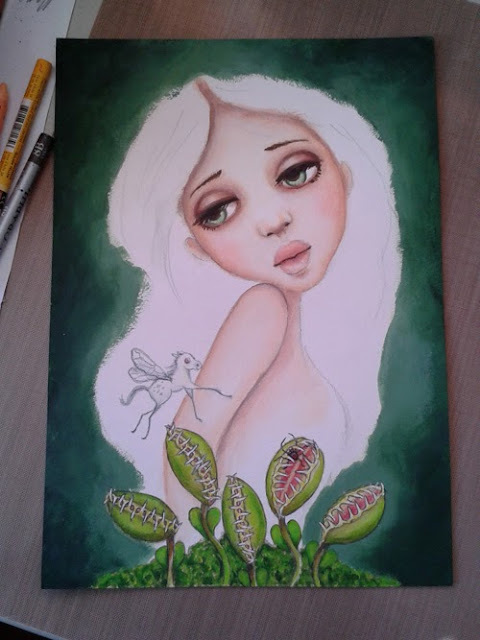 Blocking in colours and getting some detail into the skin with acrylics and caran d'ache II watersoluble crayons. 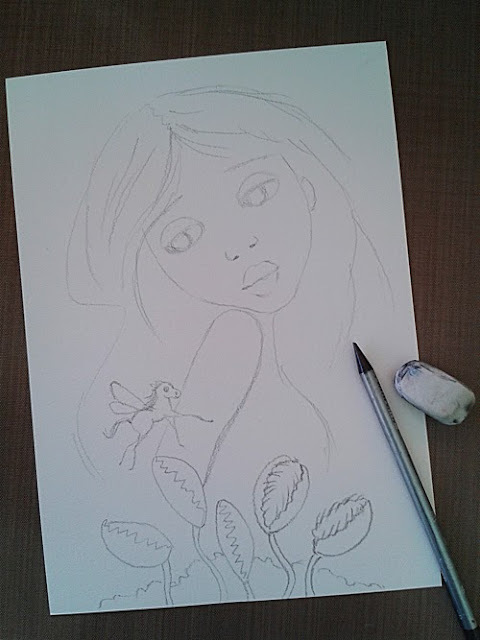 Working on the horsefly and foreground details, also a little graphite pencil here and there for added definition. 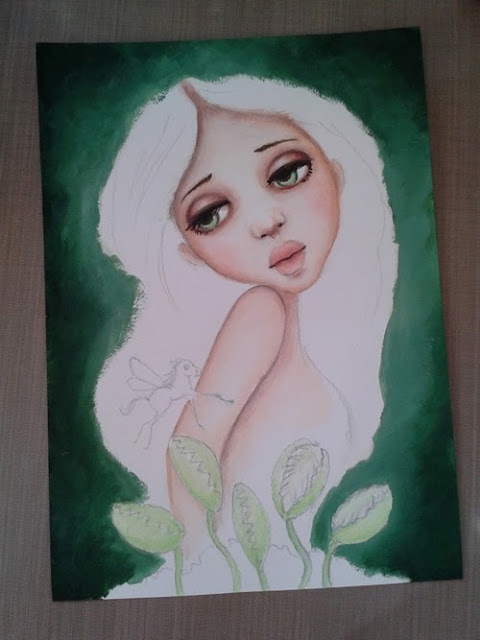 I am not overly happy with the background colour and the hair looking a bit too much like spaghetti! 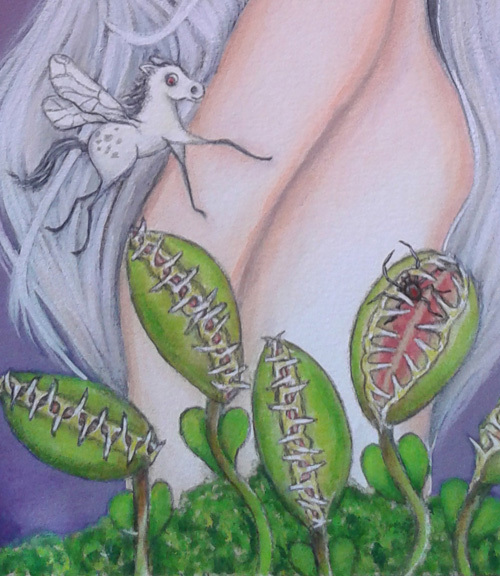 Close up of horsefly and spider. 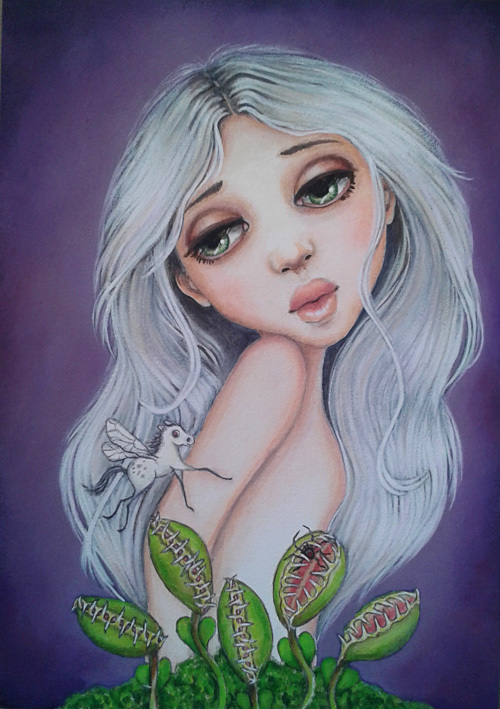 Finished artwork, I decided to change the background to soft shades and tones of purple and soften the hair up. Join me on my next blog post where I will be sharing with you an artwork that shows what vice lures me in. As not to miss this, enter your email in the subscribe box to get free blog updates, or even grab my cute button! Anyhoo! I hope you have enjoyed my first blog post, comments are welcome and encouraged. Thanks! p.s If you really enjoyed this post, please spread the word! Much appreciated. Serena, congratulations on your first post! I LOVE the details in Fatal Attraction, a mini horse with butterfly wings! How great is that! And it's lovely to see your photo! Well, you shouldn't Serena, because you're a stunning girl! Well done you, great blog. I hope mine looks as good - I am working feverishly on it as we speak !! I definitely have a face for radio though (lol) , but i guess i am going to have to do it. Looking forward to your next blog entries - One problem though , there is nothing to press on the subscribe button. Thanks Steve, I will look forward to your blog also. The about me pic was taken three days ago. I know they say it's nice to see the face behind the posts, so I had to give in haha! I am concerned you can't press on the subscribe button. I will try and see what is going on there. Did somebody say this was simple! 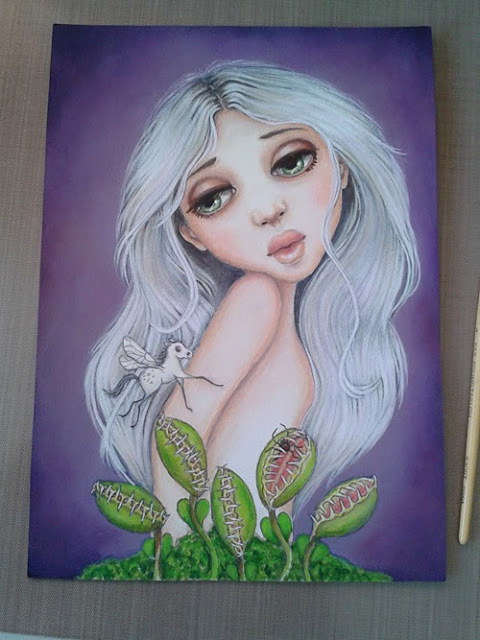 You know how much I love your art hon♥ and your blog is amaaazing, good luck! hehehe, 'horsefly', I love that name! When I saw the wings I thought of a unicorn, but of course, it doesn't have a horn, so you got the name right! I love your artwork, and am so happy to see your new blog, keep up the good work! I love your work Serena. Congrats on your first blog post. Can't wait to read more. Wow...beautiful is not the right word for this amazing painting.....I love it ! Oh Serena! I yet have to read the comments here, but could not resist to post one first! What an incredible painting, the first thing I saw was that face, and it reminded me of why I always loved your art so much, your faces are put of this world! And then I scrolled down and saw the rest, great imagination! But please, don't let that sweet and cute unicorn fall into the flesh eating plant!